One of the toughest parts of being away at work is being away from your pet for 12 long hours. 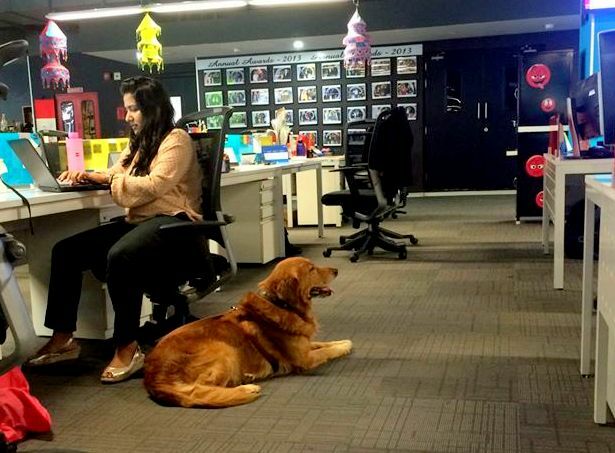 While most companies abroad allow pets, in India it still remains a much-desired perk. However, many startups across India are taking matters of the fur into their hands, and welcoming pets into their offices and teams. After all, apart from free lunches, cool company schwag, being a pet friendly office can be a great work culture hack. Various studies have proven that having a pet around is good for morale and helps reduce stress levels, and these proud pet parents will vouch for the same. 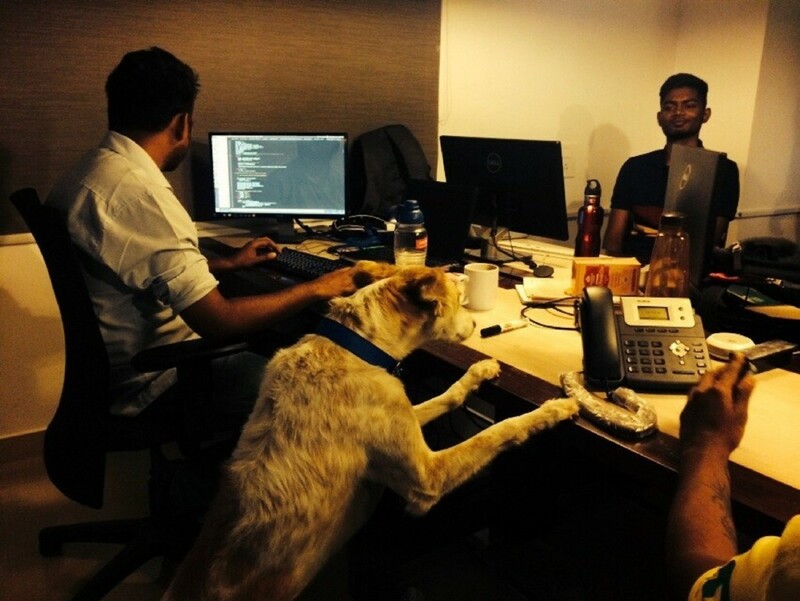 Here’s some of the startups in India that are pet friendly, along with the pets that grace their offices. This unicorn startup allows pets at work. It all started when a top executive started bringing her pug Bella Boo to the office. Now Walter, the lab and Becky, the cat are a common fixture at the InMobi office. 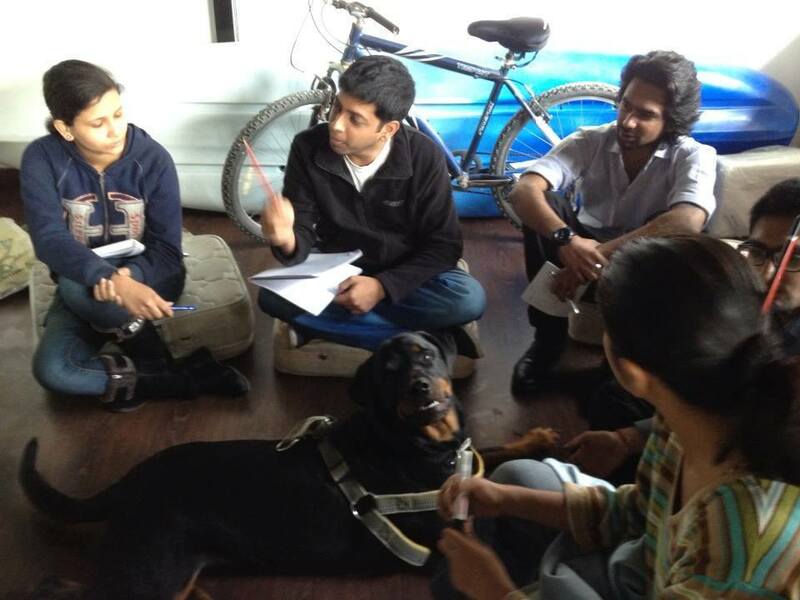 Walter’s presence even reportedly inspired Mohit Saxena, InMobi co-founder to get a dog of his own. Today many employees bring dogs to work, especially on weekends. 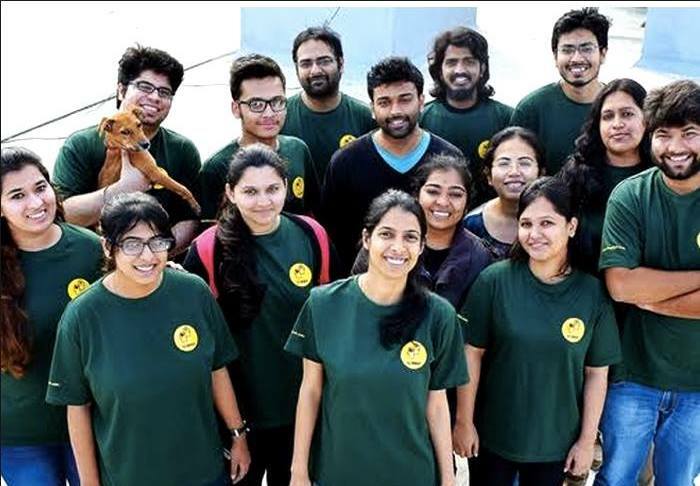 This online counseling startup employs a Chief Fun Officer, Penny, who was rescued as a puppy by the founders Richa and Puneet Manuja and has been in the office ever since. 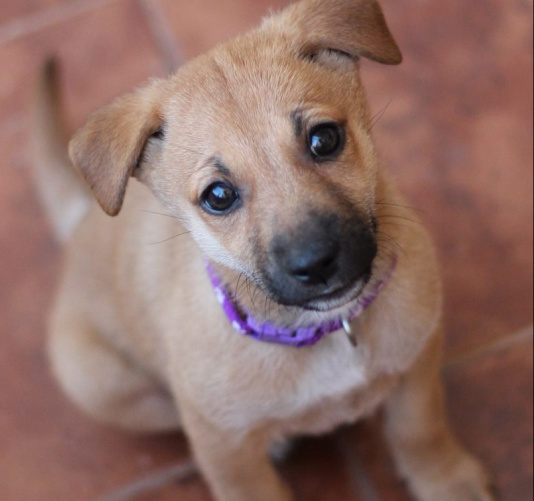 “Her primary duties include eating her food as well as others’, sleeping, peeing, running around and getting cuddled. 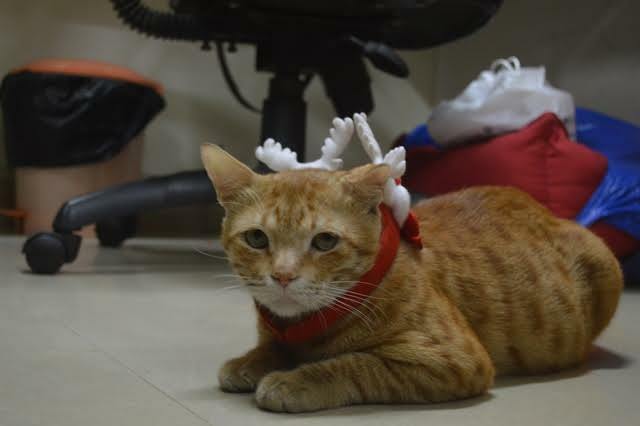 She is 8 months old now and makes sure everyone in the office stays happy.”, says Ananya, a Yourdost employee. Ginger the cat came into Pagalguy’s office after he was rescued from a fire. But today he’s an important part of the office and enjoys his own Facebook page. Now any employee is welcome to bring their own pets. 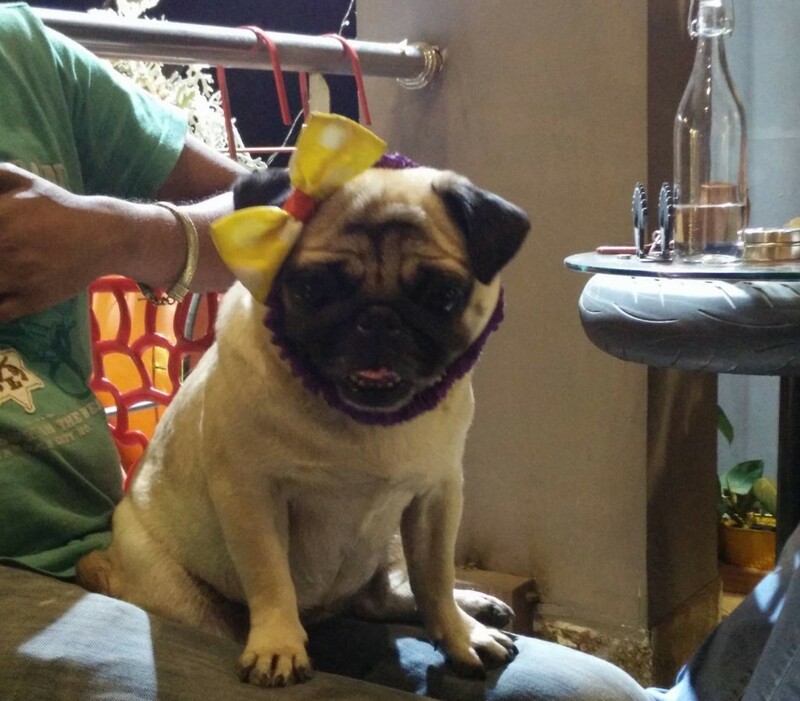 “After Ginger came to Pagalguy, the office has become a livelier and happier place. There is a stress buster for everyone now. His body is warm and clean and everybody loves to rest their head on his stomach and relax. Ginger allows office employees to do whatever they want to him.”, says Allwin Agnel, founder and CEO. The Chumbak Studio is a pet-friendly space, where the in-house lab Hugo can be seen snoozing around in the office, along with a pretty fighter fish called Shiny sitting on a designer’s desk in a glass bowl. There are also occasional lively visits by Ginger, a naughty cat. 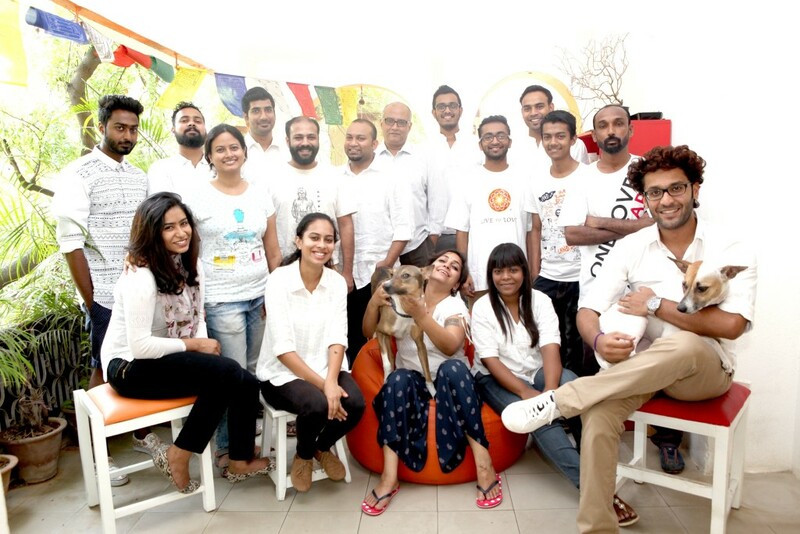 Hugo is also usually a part of most of Chumbak’s employee engagement activities. “Pet-friendly workspaces, we think, just tend to be that much less stressful, because what could be more of a welcome break than an adorable puppy gazing into your eyes with a toy in its mouth, inviting you to play? There’s a certain synergy they bring to the team, and one of the first things they teach us is how much happiness there can be in spontaneous moments.”, says the blog at Chumbak. 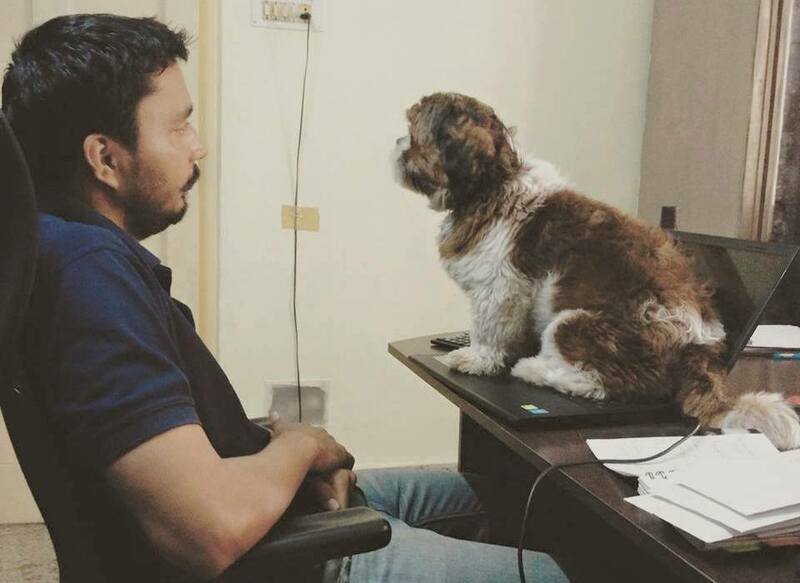 The CEO’s dog Chotu Augustine (Yes, he has his own Facebook page) is a regular in the office and has always been a part of the team. “He is the Chief Collections Officer but is useless as he can be bought for a biscuit.”, says Kenneth Augustine, the CEO. “Once a client’s team came in (there were four of them) and a few of us took them into the conference room for a brainstorm. Chotu was made to hang around outside. Actually he was lured with a few biscuits but when they finished he decided that he had to be a part of the discussion inside the room so he pushed the door open, walked in, wagged his tail in greeting and then sat in the corner.” Kenneth reveals. At this fashion store, customers are allowed to come shopping with their pets. While the store caters to the humans, the pets can mingle with the in-store “brand mascot” Hachiko, who came into the store 7 months ago after he was rescued. “Hachi welcomes everyone with a wagging tail. We have even had a few customers come shopping with their pets, and it was not just a shopping experience but pleasure to watch two dogs playing! 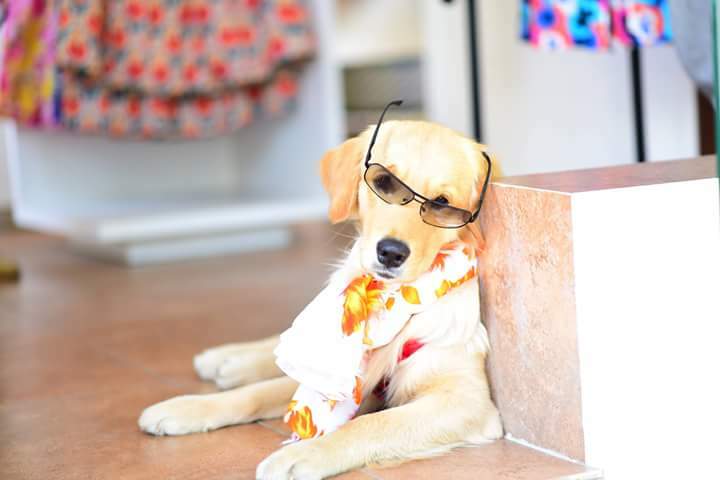 He relieves tension with his gimmicks and since he so photogenic, he looks great in marketing campaigns!”, says Sreetama Ghosh, the proud owner of the store and mommy to Hachiko. This real estate startup comes with 12 cats and 4 dogs in their home office setup! “The four people you see in the photo have been out all day, but just coming back to an office that is filled with animals can be such a stress buster. “, says Vidhu Goyal, the co-founder. The NGO Rang De’s office enjoys the company of Berry, an Indie who was adopted off the streets after the employees experienced serious craving for an in-house dog. “We take turns in taking care of her. This kinds of brings a sense of responsibility and team members take turns and play with her. Berry goes to different team members place every other day. We are kind of proud of her adaptability quotient!”, says Soumya, Chief Belief Officer at Rang De. Moby, a Shih Tzu, who was gifted to the co-founder’s by her boyfriend is now an integral part at this ad agency’s office. “The thought of leaving him behind was unbearable. But now he’s an integral part of everybody’s work schedule, be it the tail wagging in the morning, the mid morning break playing with him, the drama during lunch time.”, says Malvika Pai, co-founder at Look What You’ve Done agency. 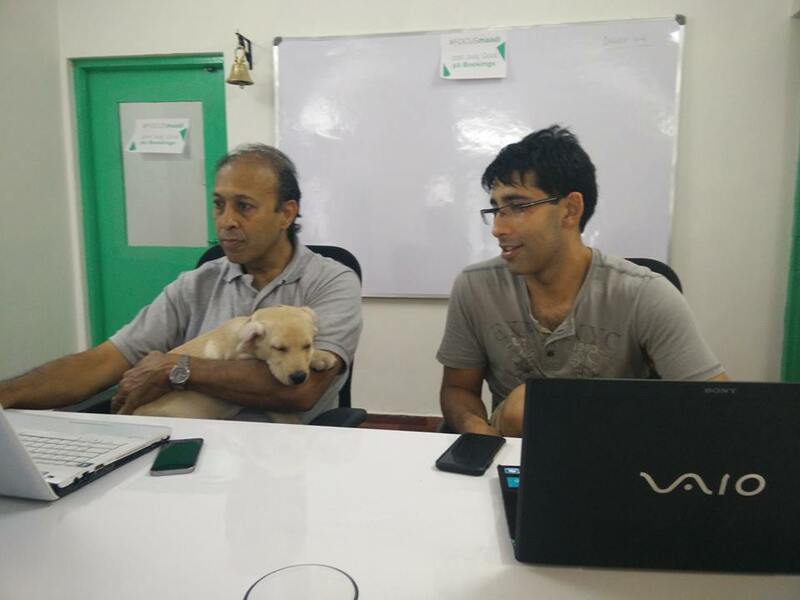 Zorro is CEO & founder Ravitej Yadalam’s 1 year old golden retriever at the online deals startup Pennyful. “He comes in whenever possible and instantly brings joy to the office. It creates camaraderie, as everyone who normally are glued to their desks get up and recharge themselves. 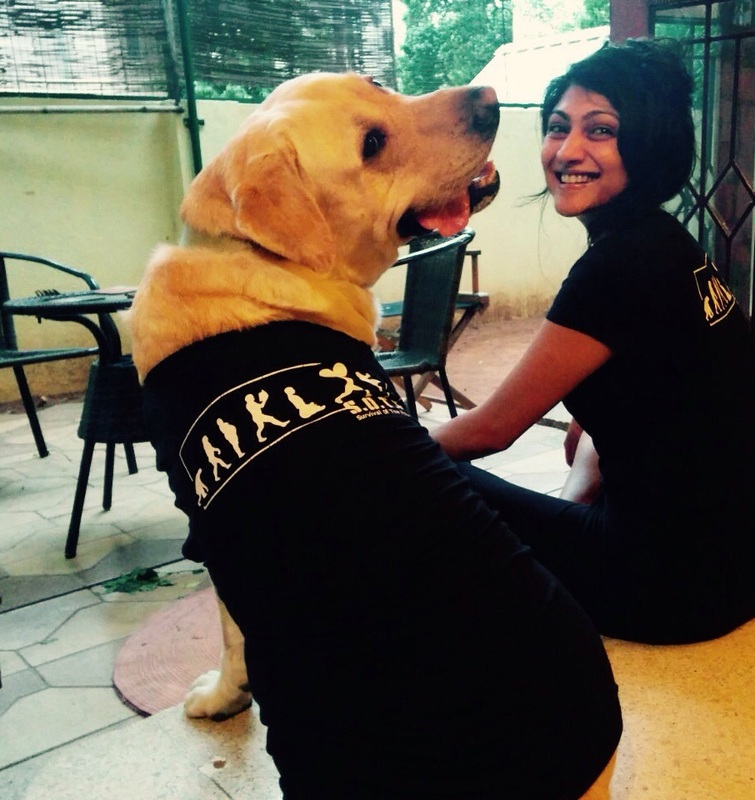 Also, employees take turn to pet or walk Zorro!”, says Priya Stephen, an employee. Bono, the golden lab, has been the “Chief Cuddling Officer” at the production house CurleyStreet.com for the last 4 years. ” When Curleystreet Media was born, our office space was chosen specifically so that Bono had a backyard to play in. He is the first to come in to work every day so that he can be there to greet everyone and the last to leave. 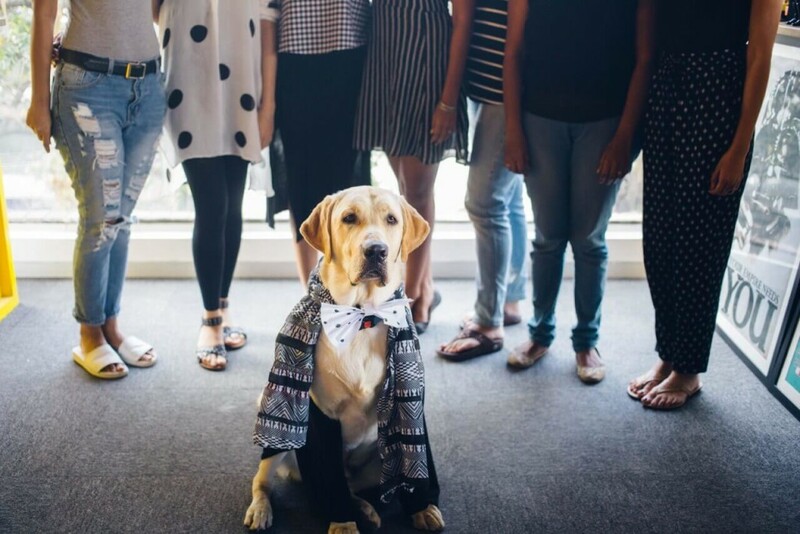 No CurleyStreet Media production, celebration, brainstorming session or event is complete without his furry presence.” says Pavitra Chalam, director at CurleyStreet. The animal-friendly biker cafe has a bunch of dogs and cats, usually rescued from the streets, who effortlessly mingle with the customers over a coffee. The owners Aashish and Abhijit are staunch animal lovers. While a few people bring in their own pets to the cafe, several have even adopted pets from the cafe. This content creation agency comes with 2 dogs ‘Bitey’ and ‘Content’ as Chief Well-being Officers. “They keep stress far away. We get cuddles in exchange for couch time. Our company has included Bitey and Content in our staff welfare budget. Recently Content had a terrible leg injury and we got him treated through our company. They have been a part of many meetings, clients mostly are ok and only slightly weirded out. 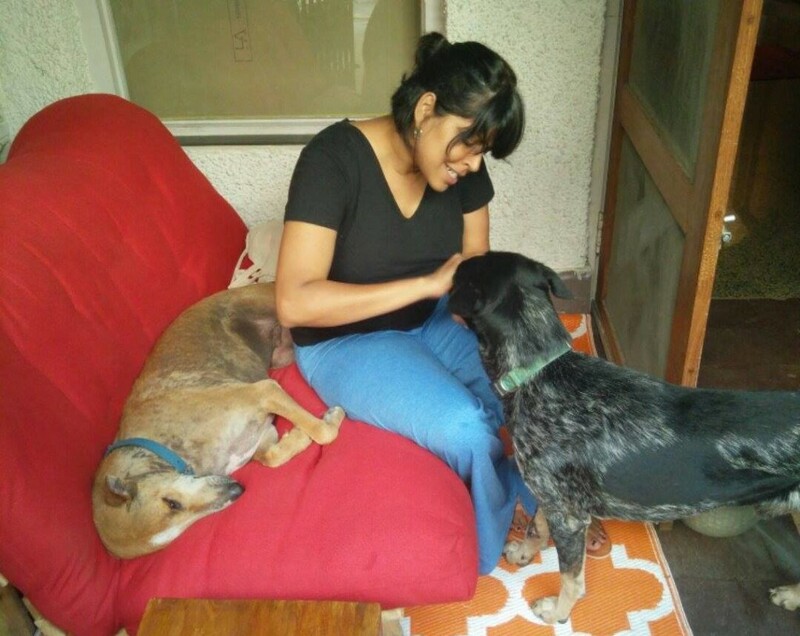 Once we tell them they won’t do anything except sniff you clients are at ease.”, says Rheea Rodrigues Mukherjee , the co-founder. 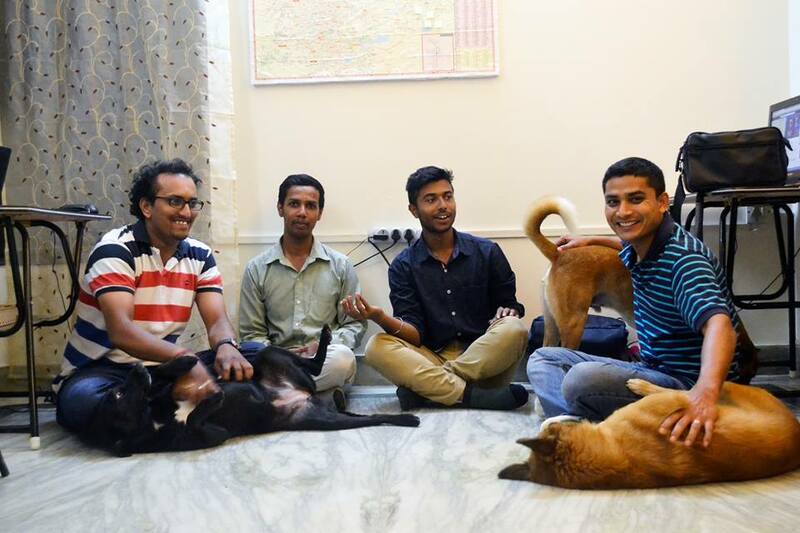 The online brokerage startup Zerodha has 2 rescued dogs – Zero, and Q in their 30,000 sq. ft office. “As a startup, our work environment is relaxed and their presence only adds to that appeal. They keep our spirits high. Initially, dogs feel really uncomfortable having so many people around and tend to bark. But they are smart and quickly recognise the space as home, get used to it and stop disturbing people.”, says, Nithin Kamath, CEO at Zerodha. This ad agency is home to two Indies Zoe and Skyye, and the owners believe that they keep the team calm, happy, smiling and engaged all day long. “We don’t just allow pets, we also foster them! We have had many people bring their pets to office. In fact, for our anniversary, we traveled to Goa with four dogs! We also had a rescued crab at the office for a couple of days. We are hoping to have an adoption camp soon.”, says Alex. This community collective and production studio loves cats so much that it’s named after them. 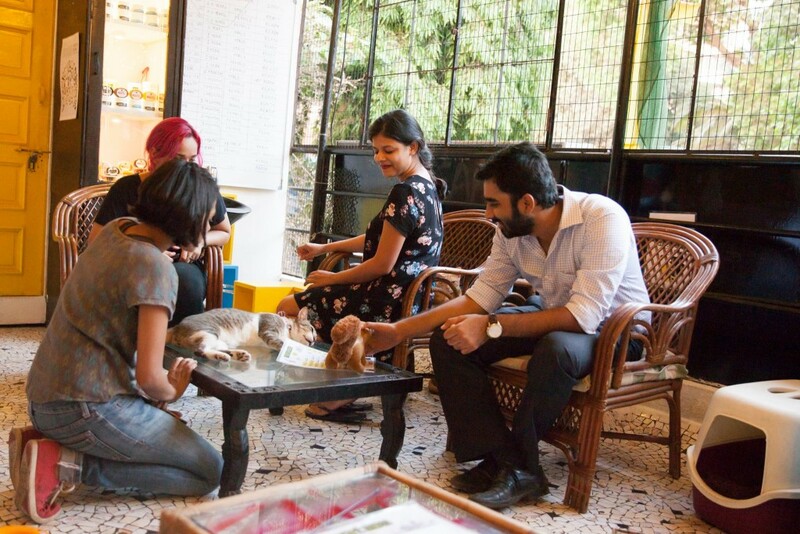 When not coming up with innovative ideas for art, literature and writing, the people at Cat Cafe Studio are playing with the 27 odd rescue cats that throng the place. Everyone else is free to bring their own cat too. “Animals are the best stress busters you will ever find, so there is hardly any room for fights, stress, politics, etc. which is usually the case at most workplaces. When it comes to anything related to any of our cats, everyone stands united with each other no matter the personal differences. The work is always better with a cat sleeping on your desk. “, confirms Mihir Bhatt. At the personal driver hiring startup DriveU, all three founders have one dog each and a few employees bring their dogs to work as well. “At DriveU, everyone bonds over bathing a dog once a week, taking them for a walk, playing football in the outside mini football field and respond to their emails with a dog lounging around at their feet. When hiring new employees, we make it very clear that we are pet-friendly and candidates also get a taste of this when they come in for an interview. Most rooms are soundproof, feature water bowls, dog beds, and cleaning wipes. Additionally, there are pet perks like dog biscuits, dog toys, chew-sticks and bones that are used while the dogs are being trained for tricks and other games.”, says Madhushri Verma, a DriveU employee. Not just that, DriveU also donates a percentage of their yearly revenues to NGO’s working for animals to help promote adoption of stray animals and for medication and cure of injured animals on the road. 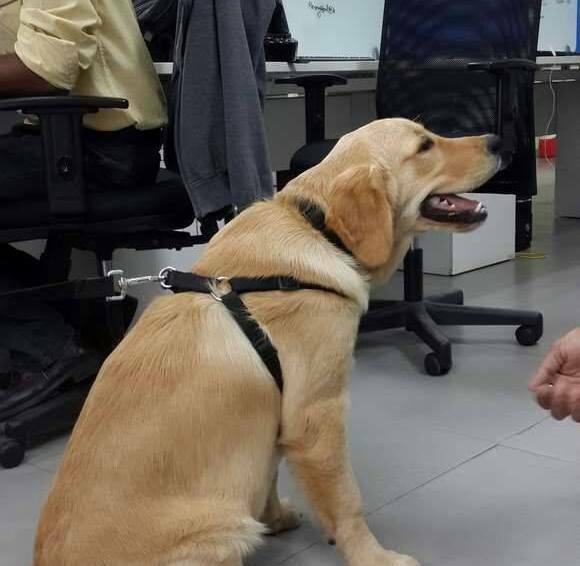 Here’s hoping more Indian offices go pet friendly and welcome a furry friend into their offices as warmly as into their hearts.